A visualization from a supercomputer simulation shows how positrons behave near the event horizon of a rotating black hole. The gravitational pull of a black hole is so strong that nothing, not even light, can escape once it gets too close. However, there is one way to escape a black hole — but only if you're a subatomic particle. As black holes gobble up the matter in their surroundings, they also spit out powerful jets of hot plasma containing electrons and positrons, the antimatterequivalent of electrons. Just before those lucky incoming particles reach the event horizon, or the point of no return, they begin to accelerate. Moving at close to the speed of light, these particles ricochet off the event horizon and get hurled outward along the black hole's axis of rotation. "How can the energy in a black hole's rotation be extracted to make jets?" Kyle Parfrey, who led the black hole simulations during his time as a postdoctoral fellow at Berkeley Lab, said in a statement. "This has been a question for a long time." Parfrey is now a senior fellow at NASA's Goddard Space Flight Center in Maryland. 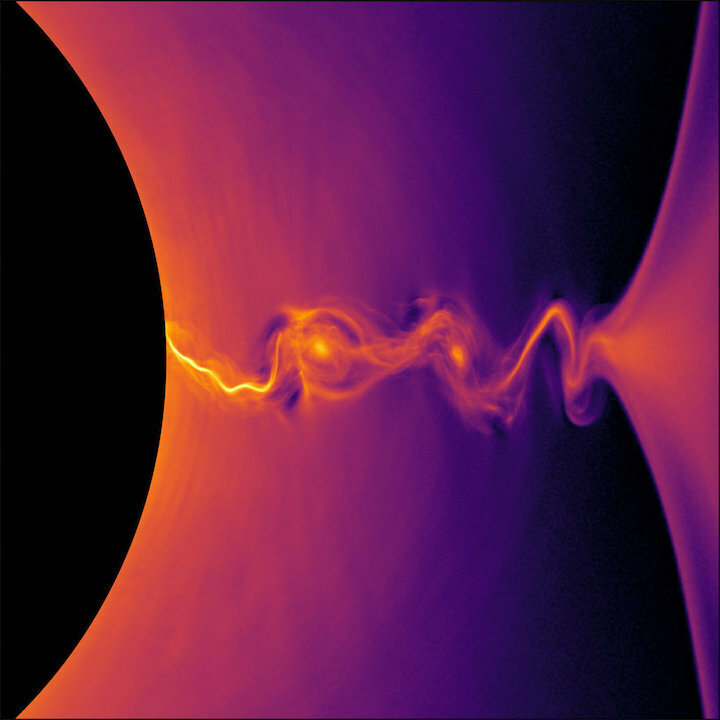 To try to answer that question, Parfrey and his team devised a set of supercomputer simulations that "combined decades-old theories to provide new insight about the driving mechanisms in the plasma jets that allows them to steal energy from black holes' powerful gravitational fields and propel it far from their gaping mouths," LBNL officials said in the statement. In other words, they investigated how a black hole's extreme gravitational force can give particles so much energy that they begin to radiate. "The simulations, for the first time, unite a theory that explains how electric currents around a black hole twist magnetic fields into forming jets, with a separate theory explaining how particles crossing through a black hole's point of no return — the event horizon — can appear to a distant observer to carry in negative energy and lower the black hole's overall rotational energy," LBNL officials said. "It's like eating a snack that causes you to lose calories rather than gaining them. The black hole actually loses mass as a result of slurping in these 'negative-energy' particles." Parfrey said he combined the two theories in an attempt to fuse ordinary plasma physics with Einstein's theory of general relativity. The simulations had to address not only the particles' acceleration and the light coming from the relativistic jets, but it also needed to account for the way that the positrons and electrons are created in the first place: via the collisions of high-energy photons, such as gamma-rays. This process, called pair production, can turn light into matter. "The results of the new simulations are not radically different from the those of the old … simulations, which is, in some sense, reassuring," Robert Penna, a research scientist with Columbia University's Center for Theoretical Astrophysics who was not involved in the study, wrote in a related "Viewpoints" article in the journal Physical Review Letters. "However, Parfrey et al. uncover some interesting and novel behavior," Penna said. "For example, they find a large population of particles whose relativistic energies are negative, as measured by an observer far from the black hole. When these particles fall into the black hole, the black hole's total energy decreases." There was one surprise, though. Parfrey's simulations show that there are so many of these negative-energy particles flowing into the black hole "that the energy they extract by falling into the hole is comparable to the energy extracted by the winding of the magnetic field," Penna said. "Follow-up work is needed to confirm this prediction, but if the effect of negative-energy particles is as strong as claimed, it could alter expectations for the radiation spectra from black hole jets." Parfrey and his team plan to further improve their models by comparing the simulations with observational evidence from observatories like the new Event Horizon Telescope, which aims to capture the first photos of a black hole. "They also plan to broaden the scope of the simulations to include the flow of infalling matter around the black hole's event horizon, known as its accretion flow," LBNL officials said.